When you win the NAFCU Services’ 2017 Innovation Award, you want to talk about it-so that’s exactly what Q2 CTO Adam Blue recently did. While at NAFCU’s Annual Conference in June, Blue sat down with Mike Lawson from CUbroadcast to discuss our award-winning targeting and messaging platform, Q2 SMART. Building from the machine learning that Q2 has been using for fraud detection since 2008, Q2’s data scientists and engineers, led by Blue, asked themselves what else this technology could do. Growth for financial institutions, Blue recognizes, will happen in the digital channel —where Q2 SMART can tap into a wealth of data. 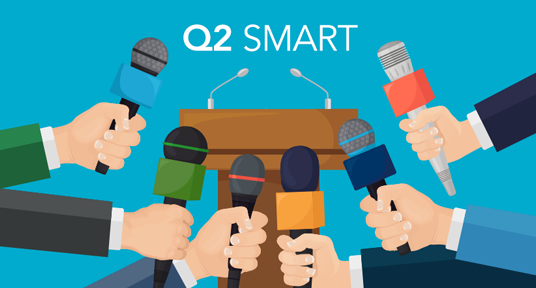 He’s confident that Q2 SMART will reveal important opportunities for credit unions and banks. Besides helping FIs target account holders with existing products, the data patterns that emerge from Q2 SMART can also provide a roadmap for developing new products —as well as enhancing user experiences. For the full interview, click here, or for more on Q2 SMART, check out our analytics page.